Redpath Sugar has helped Canadian bakers for over 160 years. I am pleased to have the opportunity to review the new Redpath Canadian Bake Book. The book is a collection of favourite classic recipes originally brought to Canada from all corners of the world. 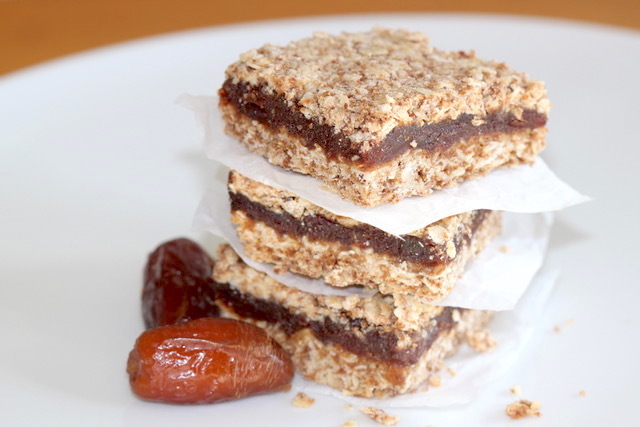 The cookbook has tested and perfected recipes. This book has already become a favourite in my kitchen. 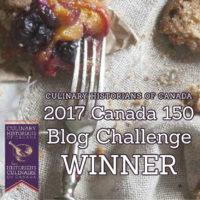 The Redpath Canadian Bake Book has over 200 recipes that include cakes, breads, desserts, special occasion recipes, many baking tips and secrets, and even a section on confection, which makes this pastry chef very happy. One recipe in particular, Salted Vanilla Caramels, caught my eye. These delicious and very addictive caramels can be made easily and quickly in only 6 minutes in your microwave oven. The story of Redpath Sugar: the beginning, the history, the commitment to environmentally conscious sugar manufacturing. How Redpath crafts its sugar: I learned about the series of steps it takes to clean, filter, boil to the final crystal and drying stages. The Baker’s Kitchen: a detailed section outlining what it takes to be prepared for baking day: pantry stocking, refrigerator and freezer staples, must have equipment, and even how to test raising agents (yeast, baking powder, baking soda) for freshness. Should you buy this cookbook? Absolutely! Buy one for yourself, family members, and all your friends. They will thank you for it. I think it would also make a perfect wedding shower present – it will be a treasured and well-utilized gift based on the reasons outlined below. There are a number of reasons for me to make this endorsement/recommendation. The book will be excellent as a reference resource with specific sections as mentioned above, with a metric conversion table, and a comprehensive index. The recipes are clear with well-written methods. The photography is very professional and clearly illustrates what the final result will look like. 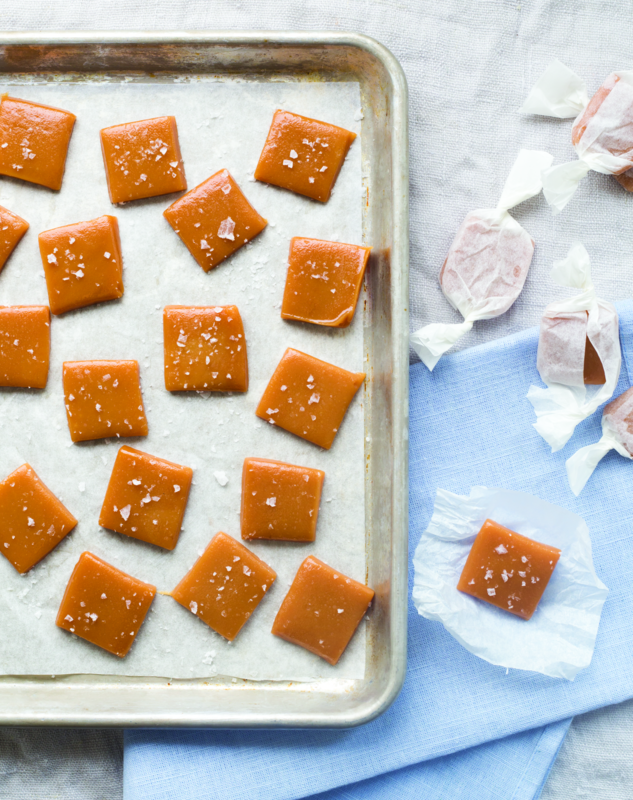 Let’s get to the featured recipe – Salted Vanilla Caramels. 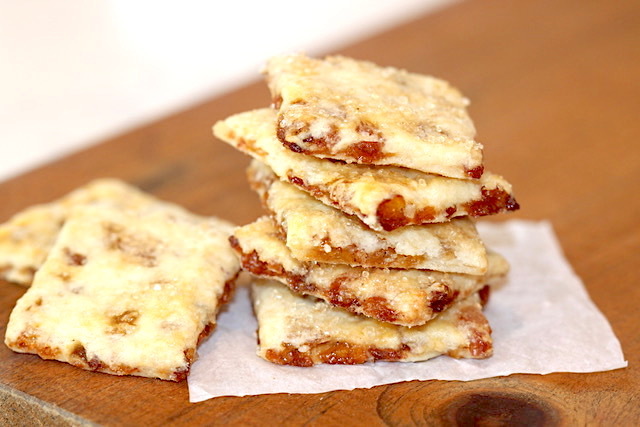 Excerpted from The Redpath Canadian Bake Book by Redpath Sugar Ltd. Copyright © 2017 Redpath Sugar Ltd. Published by Appetite by Random House®, a division of Penguin Random House Canada Limited. Reproduced by arrangement with the Publisher. All rights reserved. CHEF TALK: This recipe for Salted Vanilla Caramels is a cinch to make in the microwave and takes only about 6 minutes. I will share with you a step-by-step visual guide so you can see for yourself how easy it is to do. An edible gift for someone special! 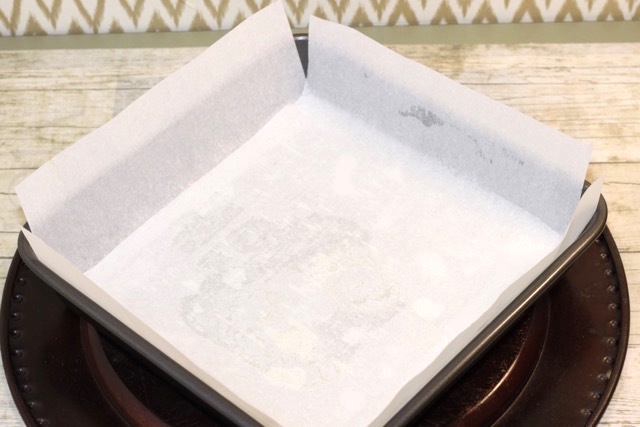 Line the base and sides of an 8″ square baking pan with parchment paper, leaving an overhang of paper on two facing sides. 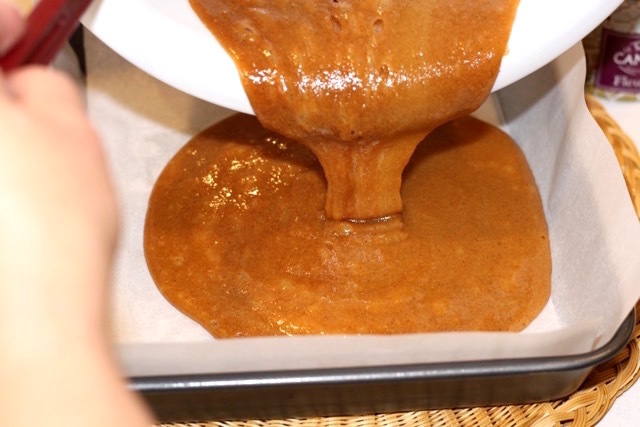 (This will help you remove the caramels from the pan.) Set aside. 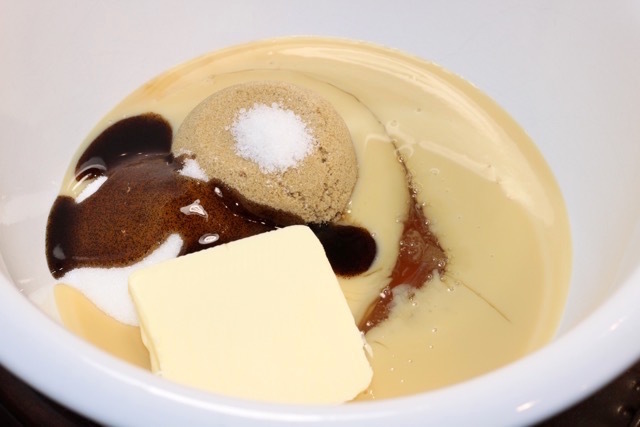 In a large microwaveable bowl, combine both sugars, the corn syrup, condensed milk, butter, vanilla extract, and salt. Microwave on high power for 6 minutes, stirring every two minutes. 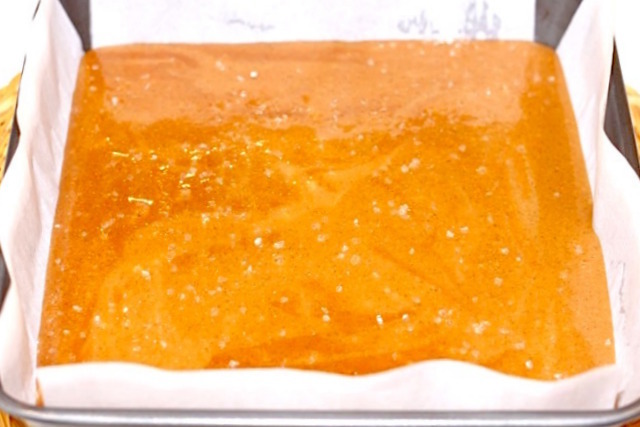 Check the temperature with a candy thermometer: it should register 250°F. If the mixture is too cool, heat for 30 seconds intervals until it reaches 250°F. 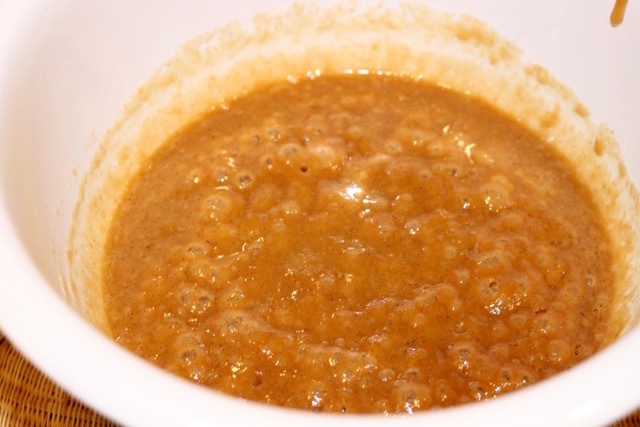 Carefully pour the caramel into the prepared pan and sprinkle with sea salt flakes. Let cool at room temperature for at least 2 hours. 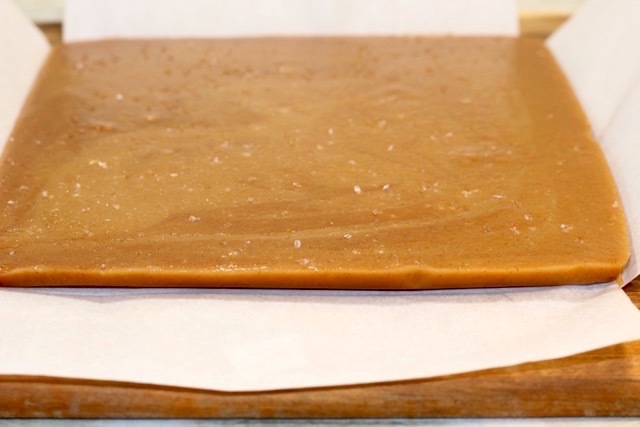 Lining the pan with parchment paper, leaving an overhang for ease of removal of the caramels. Salted Vanilla Caramel has set for two hours and is now ready to cut. 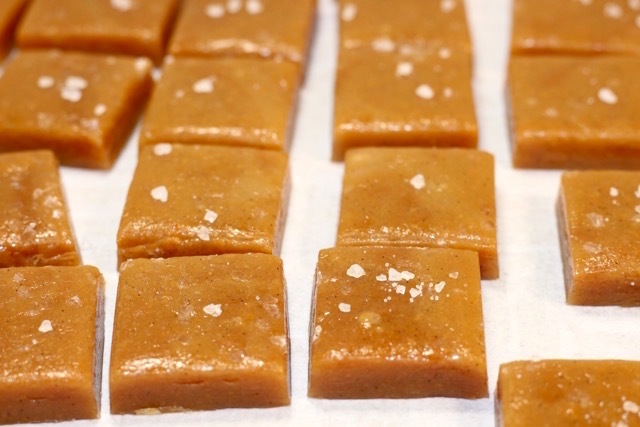 Salted Vanilla Caramels are garnished with sea salt and cut into pieces. 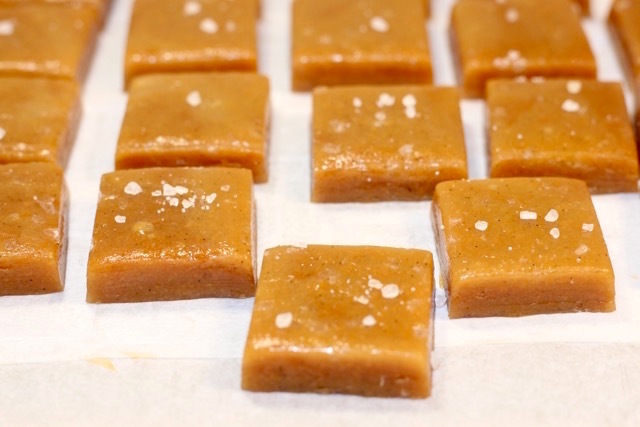 This recipe for Salted Vanilla Caramels is a cinch to make in the microwave and takes only about 6 minutes. I will share with you a step-by-step visual guide so you can see for yourself how easy it is to do. An edible gift for someone special! Disclosure: A review copy of The Redpath Canadian Bake Book was provided by Appetite by Random House. All opinions are my own. Look for another cookbook review from The Soup Sisters Family Cookbook, called Tomato-Potato Soup with Roasted Garlic. Appetit by Random House – Cookbooks Galore! If you try this recipe from The Redpath Canadian Bake Book for Salted Vanilla Caramels or any other recipe from this cookbook, please leave a comment below with your feedback. Salted caramel in any form is my absolute weakness so i’m loving that you shared this recipe. These look so amazing! Yum! These look divine! I love salted-caramel and can’t wait to try these out. They would make an awesome foodie gift too! 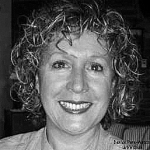 Hi, Jessica – thank you so much for your comment. Yes, indeed, these salted caramels make awesome foodie gifts – quick and easy to make and easier to give! Save a few from each batch for yourself. 🙂 Happy holidays to you! Wow! That is really easy to make! And I love how they look! They would make a beautiful edible gift. The Redpath cookbook seems like one to have. The recipes you listed from the cookbook are all so interesting and new to me, I would love to make them all! They are so delicious, Nicoletta. Have fun making them for your husband and stepson. They will love them! The Redpath Sugar Canadian Baking Book is a keeper cookbook. You would particularly love the pastry section 🙂 All the best for the holidays and thank you so much for your comments. They look easy to make and so good. Happy Holidays!